please hear and answer all my prayers and our families today and everydayHeal us all mentally and physically. Thank you. O, my virgin Mary, O most pure Virgin Mary conceived without sin, I beg you, please pray for me to your Son, Jesus Christ my savior, upon me with Your Holy Spirit, bless me, save me from the temptation, deliver me from evil and have mercy on me from my sins, give me grace to life in pure heart, pure minds, pure feels and pure acts in my life, my ministries. I beg you, O my Mother of Mercy, O most pure Virgin Mary conceived without sin, bless my parents, my families, my nuns, my community, my co-workers, my priest, and all peole who need your intercession, o our most pure Virgin Mary conceived without sin, pray for me, pray for them, pray for us. Thank you, my mother.. thank you all who had prayed for me and my intentions. AMEN. God has blessed and answer my prayers for financial help, which I received this week. Thank you God and May the Blessed Virgin Mary look on all the children in the world. Thank you God for an answer to my prayer. I was in desperate need of a pet sitter over the holidays and on the Feast of Christ the King a friend recommended her sitter. So blessed and grateful!! I ask to heal my heart from this pain. I know your with me Lord, please keep me well. I want to be here longer for my kids. take this pain away please. Lord, please help me focus in my studies, im so afraid of failing my subjects. I need your guidance Lord, strengthen me. Thank you for another year for my father. Heal him lord from his sickness. Heal also the relationship of mommy and nanay. Please lord. Protect my family always and forgive us for we have sinned. Dear Christ the King, In addition to my intentions please pray for the victory of my case due to my health condition . Please pray my husband case also that their unions will be won. Please pray my son that will be close to and have faith to God. Always guide him in his School and work and have respect and love to his parents. Thank you again. 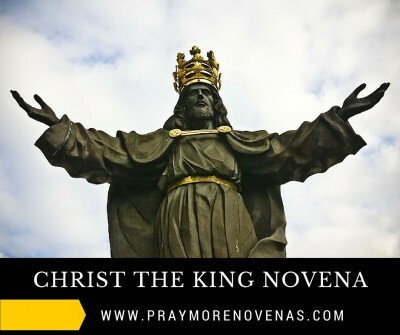 Dear Christ the King, this is the feast day of Novena ancient final prayers. Thank you Lord for I had finished the 9 days of Novena. Please hear my prayers and my intentions. I’m very stressed due to our financial struggles. We can’t pay our debts, utilities and our mortgage. Please Christ the King help and hear my prayers to solve my problem. Give miracles for the appeal of my Disability Tax Credit that the Tax Revenue will give them consideration and they will approve for the 2nd time, this will help me to solve my problem in financial. Pray my husband will be hire for the night shift fulltime position in his present job in A. Continous heal my husband on his gambling addiction. Pray my daughter and guide her on his job and help us to support the payment in our mortgage. Bless my families and relatives in unity, love, happiness, respect and peace. Thsnks John Paul and Annie that you gave me the opportunity to pray all the novena that you sent us to my email. Thank u you for everything. My prayer/Novena request is for a baby for my daughter and son in law. We have one more week to wait before we know if she is pregnant by invetro fertilization. Please pray with me that God will grant our petition. Thank you Christ the King for allowing me to pray this novena with you. Help me to continue praying for all those that are in need of prayer. And never allow me to stray from you. I love you Lord Jesus. I am so thankful for the many blessings that you have bestowed on me and my family. Please continue to watch over them. In closing, I thank you for your interssetions. I believe that my prayers are answered. Thank you God for all my blessings. IJN. For my husband Wayne to sign his new work contract now. For me, my husband Wayne, my son Nick, my daughter Jenna and my daughter in law Jess to remain in good health and be blessed with long life. For my entire family to have a closer walk with Our Lord and Savior Jesus Christ. Thank you! The man who has been abusing my daughter has agreed to our peaceful solution for their separation. Alleluia! Pls. Pray I find the right care giver to help me take care of my husband who has dementia and cardiovascular disease. Our adult children do not live in town and he relys on me for all his needs. Pls. Pray for strength, courage, endurance in my journey. Thank you. Please protect my children from harm and illnesses. Please defend my daughter against Alex C. Please help my son to find a job after his internship. Thank you, my Lord, My King! I FEEL MORE CALM. GOD BLESS ALL. For Dianne , my long time friend, who passed away last week with cancer. For Trudy, also long time friend, who passed away yesterday. That our President elect will make good and faithful decisions about and with our country. That all protesting will stop. That black lives matter will start working with the police force and not blame them for everything. Listen when told to do things like drop your guns etc. Thank you lord Jesus for listening to my prayers though at the moment it may not seem good but you are present in our lives all the time as we are children of your kingdom and you are our savior and king. Lord Jesus, I pray that you keep my grandson strong and sober. I pray that he becomes the awesome person who You want him to be. Please help him to resist temptation and lean on your love, in times of crisis. Praise to you. Lord jesus I place my financial needs into your hands. I place my son’s exams into your hands and I pray for success. Lord jesus please release the funds into my account so my son’s tuition fees can be paid. Thank you jesus. May blessvzJihn Psul. And. Annie for stabding euth ys in prayer nay theirbprayers be answers as well.